I woke up this morning to the most beautiful (and unexpected) surprise and I have just been smiling non-stop ever since. I am sure it's no secret, I absolutely love book covers and I have confessed a number of times that I do sometimes judge a book by its cover. 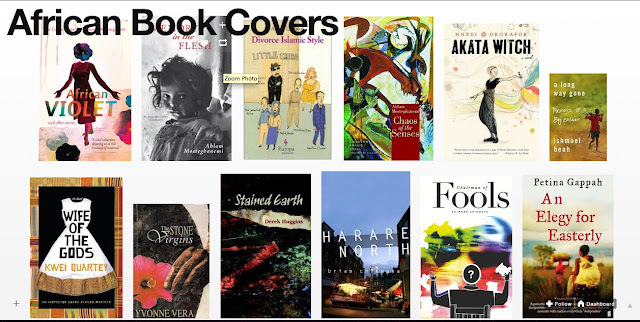 I've looked at cool book covers, different book covers in different countries, and even the African Writers Series. A few months back I started a tumblr dedicated to just that - African book covers. I started it because I wanted to show the diversity and variety of African literature cover designs. It was my ode to African book covers. And now my ode to book covers has made Africa is a Country's Summer List: Africa Tumblrs. "I know there are some out there that think the last full book written by an African is 'Things Fall Apart' and that Africans only write short fiction during the Caine Writing Awards. When you meet such, just direct them to this beautiful tumblr where the author has extensively curated the front covers of books written by Africans, past and present. Whether you are seeking nostalgia (African Writers Series or Pacesetters) or just want to be informed about African authors, this is a tumblr for you". To say I was shocked and excited to find out I was on the list is an understatement, and reading that put the biggest smile on my face. I have to say I am also honoured to be on a list with some photo tumblrs I think are ridiculously cool. Please do check out my tumblr, African Book Covers.